Bow: Front part of a boat. Stern: Back part of a boat. Starboard: Right side of a boat. Deck: Top of the boat which covers the hull. Windward: Sailing with your boat into the wind. Leeward: Sailing with your boat away from the wind. Mainsail: The large sail which is attached to the mast and the boom. 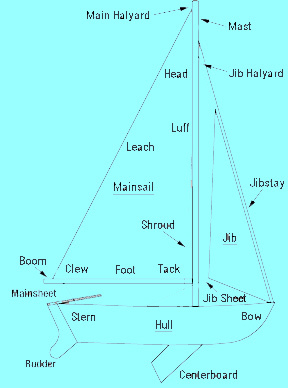 Headsail/Jib: The sail in the front of a boat between the forestay and the mast. Often called the headsail. There are several types of Jibs. Genoa Jib: overlaps the mainsail and is used to provide maximum power in light winds. Working Jib: smaller jib which fills the space between the mast and forestay. Used in stronger winds. Spinnaker: A large balloon sail attached to the mast at the front of the boat. Used when sailing downwind. 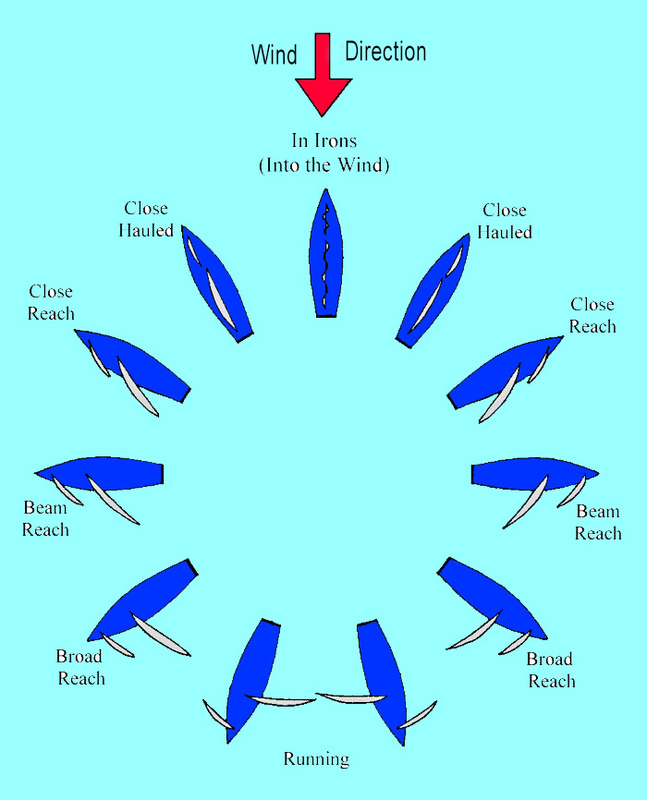 Coming-About or Tacking: The bow of a boat goes through the wind as one changes from a close-hauled point-of-sail on one tack (direction) to a close hauled point-of-sail on the other direction. Only the jib needs to be adjusted, the working sheet of the jib is changed and the new working sheet is placed on a winch. The mainsail is left alone and will by itself often assume the correct position. Jibe: The stern (backside) of a boat goes through the wind as one changes from a broad reach on one tack (direction) to a broad reach in the other tack (direction). Head Up: Change a boat’s sailing course into the direction of the wind. Head Down: Change a boat’s course away from the direction of the wind. Fall Off: To head a boat away from the wind.